Analysts believe Saudi Arabia and the UAE are supporting renegade general Khalifa Haftar in his offensive against Tripoli where Libya’s internationally recognized and UN-backed government is based. The Mehr News Agency has, in an article, weighed in on the power struggle in Libya and the backing allegedly offered to Haftar by Riyadh and Abu Dhabi. The full text of the analytical piece follows. After hopes grew that political efforts to work out a political solution to the Libya conflict on the international stage as well as on the domestic front would bear fruit, political analysts suffered a deep shock when commander of the Libyan National Army (LNA) General Khalifa Haftar, a major player in Libya’s political landscape, suddenly announced he would launch operations to, in his words, liberate the capital, Tripoli. Eight years on since former Libyan dictator Muammar Gaddafi’s regime was ousted, the oil-rich country has not yet seen stability and security. It seems the interference of Arab countries such as Saudi Arabia and the United Arab Emirates (UAE) has contributed heavily to insecurity in Libya. Tensions flared up suddenly in Libya at a time when Haftar and Fayez al-Sarraj, the Tripoli-based prime minister, had pressed each other’s hands in front of cameras and announced that the Libya crisis would be over soon. Both sides agreed over the past month to hold national elections in Libya and put an end to the conflict currently gripping the country. 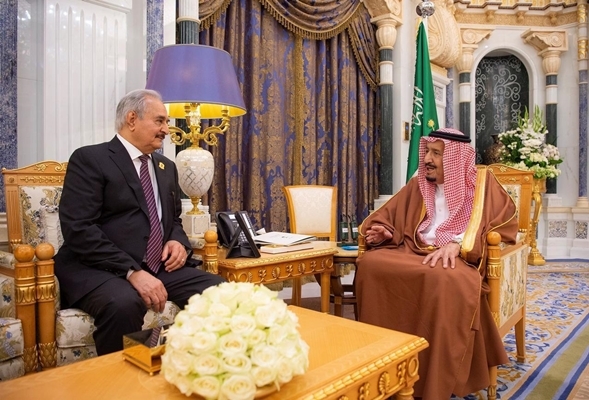 Around a week ago and a few days before the Arab League summit, general Haftar was invited to Riyadh to meet Saudi King Salman bin Abdulaziz Al Saud. Some informed sources say the trip came at the request of US authorities. Saudi Crown Prince Mohammed bin Salman also held a separate meeting with Haftar where the Saudi intelligence chief was also present. In the meeting, Salman gave Haftar the green light to go ahead with his new adventurism in Libya. One day before the Arab League summit, Haftar delivered a speech in the city of Benghazi where he announced that an integrated government would be established in Libya in the coming weeks. However, five days later, troops affiliated with Haftar said they were ready to advance toward western Libya and Tripoli. Their military hardware arrived in the city of Gharyan early on Thursday. This move by Haftar-affiliated forces ran counter to all international efforts geared to settling the political crisis in Libya, so much so that most countries and international circles, including the United Nations Security Council, called for a halt to fighting in Libya. Haftar has tried time and again to gain control of oil-rich regions in Libya. His change of position on seeking dialogue with dissidents as well as moving to take military action in the country will once again fuel civil war in the country, decreasing the odds of an integrated government in the country represented by all Libyan groups. The turnout of millions of Algerian people in demonstrations against Algerian President Abdelaziz Bouteflika as well as his dismissal led Riyadh and Abu Dhabi to become very much worried again over the possible spillover of that public anger and the possibility of seeking to bring about a regime change. Studying the developments in Libya and the stance adopted by Haftar towards holding talks with the opposition shows a surprise change has taken place in Libya only within a matter of days. It seems that the Saudi king’s meeting with Haftar against the backdrop of popular protests in Algeria is not unrelated to Saudi Arabia and the UAE’s misgivings over a possible spillover of the protests into these two countries. Failure to realize democracy in countries such as Saudi Arabia and other monarchial Arab countries, the effectiveness of public anger and ousting a 20-year rule in Algeria have struck fear into Riyadh and Abu Dhabi, leading them to fabricate a scenario to deflect public attention from developments in Algeria. This scenario requires immediate action to stir up the security and military situation in Libya. The scenario has been financed with Saudi and UAE petro-dollars. Reports indicate that Haftar has received from Saudi Arabia a financial support package worth $500 million which was sufficient to carry out operations against Tripoli and bribe some of the Libyan politicians and officers based in the city. At the moment, there are two governments in Libya locked in a power struggle: One is the government in Tripoli led by Fayez al-Sarraj, which is recognized in international circles; the other one is the administration of Abdullah al-Thani in east of the country backed by Haftar. Generally, one can say that Khalifa Haftar gets all his power from foreign governments. In fact, he was able to make his presence felt on the back of this very foreign support. As a case in point, Emirati and Egyptian jet fighters targeted the bases of Haftar’s rivals and helped him gain control over oil installations. We can say that Libya has presently turned into an arena for muscle-flexing and rivalry between Saudi Arabia, the UAE and Qatar as well. In fact, each of these countries support militia who secure their interests. In the meantime, Emirati media outlets have gone into action and taken a swipe at Qatar, accusing the country of tampering with stability and security in Libya. These media have reported that the current conflict in Libya is seen as a proxy war between the UAE and Qatar, and also bears witness to the existence of rifts within the [Persian] Gulf Cooperation Council. Libyan politicians believe the UAE, Saudi Arabia and even Egypt support Haftar’s actions with regards to Tripoli. They believe these three Arab countries seek to bring to power another Abdel Fattah al-Sisi in Libya as Haftar does not have enough money and weapons to conduct such extensive operations, and that the operations were carried out exactly one week after Haftar’s recent trip to Saudi Arabia. Accordingly, the UAE and Egypt have delivered arms and heavy military hardware to troops affiliated with Haftar. Finally, we can say that Libya has turned into an arena for rivalry among Arab countries, especially Saudi Arabia and the UAE, on the one hand, and become a tool for those countries to realize their narrow-mined interests on the other. As long as the leaders of these countries remain puppets of foreign powers and feel beholden to them for their support, war and conflict will continue in Libya and this country will not enjoy stability and calm.